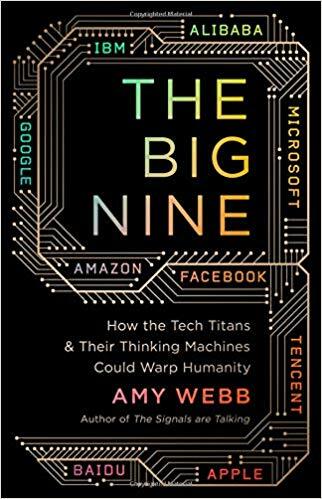 In The Big Nine, Amy Webb visits the AI-driven near-future world to which nine tech titans — and two governments — are together giving birth. More precisely, Webb projects three future scenarios for how AI development is likely to play out. Only one — and clearly the least likely — is optimistic. Still, she hopes The Big Nine will galvanize a course correction before it’s too late. Amy Webb is especially qualified to take us on a speculative journey into the future. She is a professor of strategic foresight at the NYU Stern School of Business and the Founder of the Future Today Institute, a leading foresight, and strategy firm. Among her other accomplishments, she is a Foresight Fellow in the U.S. Government Accountability Office Center for Strategic Foresight and was a Visiting Nieman Fellow at Harvard University, where her research received a national Sigma Delta Chi award. Despite what one might infer from her book’s title, Webb is most deeply concerned about the artificial intelligence activities of two governments — China and the U.S. Actually, she is deeply concerned about the AI activities of China and the AI inactivities of the U.S. First, China. Webb reminds us that China’s President Xi Jinping has formally committed his country to become the world leader in AI by 2030. Among the myriad elements of this effort: massive state funding for AI research, close working relationships between the state and major AI companies, and education in AI skills starting in elementary school. Webb also documents the frightening scope of China’s AI-powered Social Credit System which, according to a slogan in official planning documents, was developed to engineer a problem-free society by “allow(ing) the trustworthy to roam everywhere under heaven while making it hard for the discredited to take a single step.” To promote “trustworthiness,” citizens are rated on a number of different data points, like heroic acts (points earned) or traffic tickets (points deducted). Needless to say, voicing anti-government sentiments is a no-no, but even associating with those who have low scores drags one’s own score down. Decision-making AI systems then use those scores to determine who’s allowed to secure a loan, who can travel, and even where one can live and one’s children go to school. is seeking to gain an absolute advantage over the United States in economic power, workforce development, geopolitical influence, military might, social clout, and environmental stewardship . . . China is building a 21st-century empire on the foundation of data, AI infrastructure, geopolitics, and the global economy. [Failing to see this] is a grave error in judgment we will all later regret. In fact, once China achieves AI and cyber superiority, Webb expects that we will find ourselves under attack in a new kind of warfare — one for which we are woefully unprepared. In our homes and offices, the lights randomly turn off. Our smart glasses stop working intermittently. Our communications satellites veer off course. At first, the attacks seem novel and random. So we all blame Google, Apple, and Amazon for faulty products and crappy customer service. Then cybersecurity experts are gobsmacked to discover all the glitches are actually linked. It is a new kind of “Internet of Things” attack originating in China and enabled by machine learning. what you witness is worse than any bomb ever created. Bombs are immediate and exacting. Annihilation by AI is slow and unstoppable. You sit helplessly as your children’s bodies go limp in your arms. You watch your coworkers collapse at their desks. You feel a sharp pain. You are lightheaded. You take your last quick, shallow breath. It is the end of America. It is the end of America’s allies. It is the end of democracy. The Réngōng Zhìnéng (Artificial Intelligence) Dynasty ascends. It is brutal, irreversible, and absolute. And you were probably hoping that climate change was the only apocalypse we needed to worry about. That, according to Webb, is a problem of a different sort — because, to satisfy the demands of investors, our AI companies are forced to port their research into commercial products as quickly as possible. Net, net: all of the Big Nine are forced to prioritize speed over safety, the three Chinese AI companies by their government and the six U.S. companies by Wall Street. Webb believes that, with technology as powerful and novel as AI, prioritizing speed is both dangerous and foolhardy. Webb believes that, with technology as powerful and novel as AI, prioritizing speed is both dangerous and foolhardy. “AI should be boxed in until we know that the benefits of the research outweigh possible negative outcomes, or if there is a way to mitigate the risks.” This means allowing U.S. companies to pursue their research without the constant pressure of imminent investor calls and conference presentations — hence the need for the government to step in and fund basic AI research. Besides being concerned about the Chinese government’s zealous pursuit of AI, and the U.S. government’s lack of AI vision, Webb is also deeply alarmed by the narrowness of the AI tribe itself. Those working within AI belong to a tribe of sorts. They are people living and working in North America and China. They attend the same universities. They adhere to a set of social rules. The tribes are overwhelmingly homogenous. They are affluent and highly educated. Their members are mostly male. We at AI and Faith couldn’t agree more.